Our sincere thanks for your overwhelming attendance to the 1st Technical Seminar 2018 held on 23-Jan-18. Indian Frontliners published our event in their News. Please find below the full story. 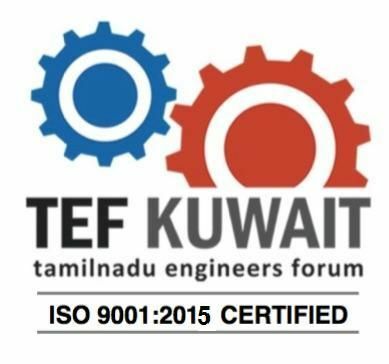 TEF organized the 1st Technical Seminar on 23rd January 2018 @ New Park Hotel, Meidan Hawalli, Kuwait. It was a nice evening, good ambience with great participation. Engr. Sethu Madhavan, General Secretary TEF-2018 shared Kural (Sacred Verses) from the sacred Book of Tamils “Thirukkural”.TEF-2018 Vice President Mr. Krishna Jegan welcomed the TEFians & Guests Speakers to the 1st Technical seminar of the year 2018. Also, explained about the importance of Continuous Professional Development in individual’s career and TEF’s commitment to add value to TEF members. He stressed the importance of active participation of all members in all the technical seminars, Conference & Engineering Excellence Award program. Two sessions were conducted from 6.00 PM to 9.00 PM; One session focused on Engineering & Consultancy and the other session focused on Finance & Investments.Engr. Raja Rathinam introduced the 1st speaker, Mr. Prashanth Sreenivasan, Director, M/s PETROCIL Engineers & Consultants to the audience. Mr. Sreenivasan has been instrumental in the Design, Construction and Commissioning of various Oil & Gas facilities in India, UAE & Kuwait. In the 1st session, Mr. Sreenivasan, Director, M/s PETROCIL shared his vast experience on the topic “Engineering & Consultancy” in the field of Oil & Gas. The session was interesting & interactive. In addition, Mr. Sreenivasn shared the expertize of his company M/s PETROCIL Engineers & Consultants and the project executed in Kuwait and other Middle East countries. Engr. Manikandan introduced the speaker of the second session Mrs. Lalitha Thamaraipandy, Consultant-Finance & Investments to the audience. She is a prolific writer and has published many articles on Finance & Investments and author of the Book: Mutual Funds - The Money Multiplier. Mrs. Lalitha shared her vast experience in the field of Finance & Investments. She enriched the audience about Mutual Funds, advantages over other investments & the risk involved. Question & Answer session was highly interactive and useful to all. Anchoring was done by Engr. Bala Subramanian and the program came to an end with a Delicious Dinner.